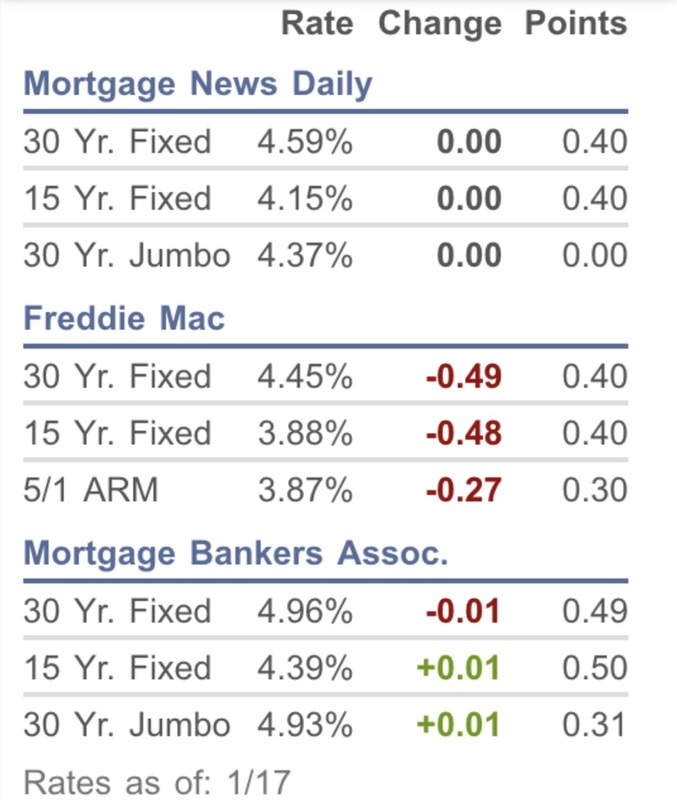 Will 30-Year Mortgage Rates Hold 4.5% Till End Of January 2019? As rates dropped 0.5% from 7-year highs hit in October/November, I’ve noted we may come up about 0.25% at certain intervals, and that it’s very risky holding for lower rates. Especially for homebuyers (as opposed to refinancers). Homebuyers can’t let rate markets dictate their family plans, and have zero control over rates. Finding the right home must dictate your plans. If the economy loses steam in the second half of 2019, rates could dip below current lows. But that’s a long way off for homebuyers making plans for jobs and schools now, and things are pretty ideal now. Fewer bidding wars in many markets, and super low rates. Markets were closed today, but going into the long market weekend, 30-year fixed rates held in the mid-4s for the second week in a row. Stocks started 2019 strong with the S&P 500 posting its sixth strongest start to a year on record according to Bespoke Investment Group. This doesn’t set the tone for the year—the S&P started 2018 strong then fell 11%—but we may get more short-term stock momentum if the shutdown ends, and if this happens, rates can rise as bonds prices drop. As for economic data, this week is light. Tomorrow we’ll see the NAR’s report how 2018 ended for existing home sales (it’s expected to be a bit lower than 2017), and Friday is supposed to give the Census report on new home sales, but that release is on hold till the shutdown ends. Existing home sales are about 90% of the market and new home sales are about 10%, but because of how each dataset is counted, new home sales are a better indicator of what the market might do in a couple months. More rate commentary below for the wonks.